ARGUS banner delivers a powerful message for positive impact: "TOGETHER EVERYONE ACHIEVES MORE." Thought-provoking banner captures attention, builds confidence, delivers friendly reminders and sparks lively conversations about life. It is designed to inspire anywhere you place them including halls, gyms, offices, media centers and more. 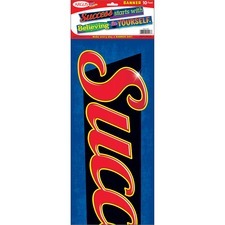 Durable, reusable sign features vibrantly colored words on a black background so it's sure to be noticed. 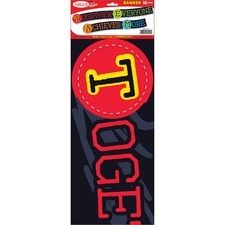 The first letter of each word is highlighted to also spell out TEAM. 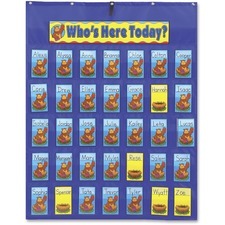 Attendance/multiuse pocket chart is perfect for keeping track of your daily classroom attendance. It can also be used to build a calendar, manage behavior, set classroom goals and more. Flame-retardant material is durably constructed for long-lasting use. Sturdy grommets allow you to easily hang the chart for quick display and removal. Pocket chart is designed for ages 4 through 11. Bulletin Board set of graphic organizers are a great resource guide. 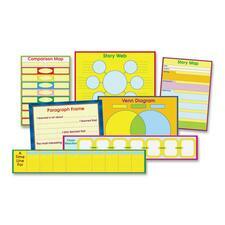 Includes story Map, Story Web, Venn Diagram, KWL Chart, Comparison Map, Paragraph Frame, Time Line (8 1/2" x 48"), Chain Reaction (8 1/2" x 48") and Resource Guide. 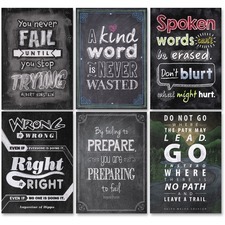 Inspire students of all ages with the powerful messages on these beautifully designed and trendy chalkboard-themed posters. Character-building messages include A kind word is never wasted; Right is Right even if no one is doing it; Spoken word can't be erased - Don't blurt what might hurt; You never Fail until you stop Trying; Be failing to prepare, you are preparing to fail; and Go instead where there is no path and leave a trail. The chalkboard background makes the six posters perfect for use with other Chalk It Up! products. 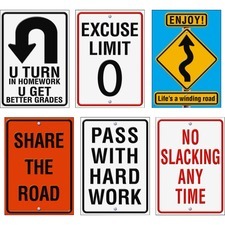 They are great for display in classrooms, hallways, offices, college campuses and more. Double Pocket Chart Stand holds two pocket charts at once so you can easily switch between subjects. Both sides are fully adjustable from 42" to 68" tall. 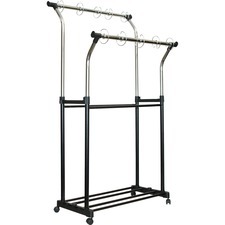 Chart stand offers 360-degree premounted wheels for mobility, no-twist clamp lock and extra storage space at the bottom for cards, pocket charts, and storage bins (sold separately). Chart includes 10 rings to hang charts (sold separately). No tools needed for assembly. 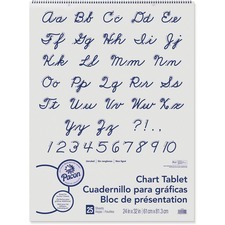 This handwriting tablet features an informative cover with each upper and lowercase letter of the alphabet in cursive as well as the numbers 1 through 10. Students can practice their cursive on the unruled, white bond paper. Spiral-bound, stiff covers provide a sturdy support. Recyclable tablet is two-hole punched for easy hanging for storage or display. ARGUS banner delivers a powerful message for positive impact: "Success starts with Believing in YOURSELF." Thought-provoking banner captures attention, builds confidence, delivers friendly reminders and sparks lively conversations about life. It is designed to inspire anywhere you place them including halls, gyms, offices, media centers and more. Durable, reusable sign features vibrantly colored words and mixed capitalization so it's sure to be noticed. 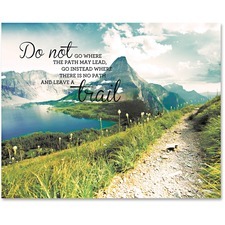 Proudly display this stunning vintage canvas print that features an illustrated inspirational message. Vintage canvas is wrapped around 1" wood stretcher bars for added depth and beauty. This gallery-wrapped canvas print is designed to be displayed without a frame and can be viewed from the front and all sides.